UCD U19s had returned from Norway the week before after going out to Molde FK Youths on sudden-death penalty kicks. An explosive game between two clubs who take youth development very seriously, UCD had winger Kevin Coffey and striker Yoyo Mahdy back for domestic duty. But they would be without talisman Captain Andy O'Reilly who suffered an injury in the first half against Molde.Centre-back Darragh Corcoran taking over the Captain's duties. The Match began even enough, Coffey suffered an injury after a tackle on seven minutes. St. Pats Callum Keane going close, Irish U18s International Jack Ryan shot past the Pats post after passing movement in the Pats half. But a set back for UCD when Neil Farrugia directed a ball into his own net from a St Pats free, then Cian Hughes headed past UCD keeper Conor Kearns goal after Keane supplied Luke Heeney to cross. Pats had their tails up and a second goal came when Keane was allowed to run through The Student defence to score 2-nil after 29 minutes. UCD Manager Marciej Tarnogrodzkiy was forced to replace the injured Coffey who wasn't right since the 7th minute, but a like-for-like in first teamer winger Simon Power. The UCD Players rallied and after a sweet passing movement shot just past the post. Then a chink of light as Farrugia got a goal back just before half-time. But St Pats got the next goal, a ball to the far post and Kearns saved the first effort with the ball hanging Hughes poked it home. But UCD weren't out of it and after some neat passing, Power broke out of defence and sprited half the length of the pitch and closing down on the penalty box when he was deliberately dragged back by St. Pats' Sean Quinn. The referee offered a yellow as inadequate compensation, Conor Crowley's direct free went into the arms of St Pats' keeper and Captain Eric Donnelly. However, St. Pats Sean Quinn was immediately substituted after the free-kick. The incident adversely affected the UCD Players as shortly afterwards St Pats scored twice in two minutes, a hip-height ball into the six-yard and Hughes was there to steer it home. From the same St Pats right Keane was inside the box and stroked the ball into the left-hand corner. 5-1 65 mins. Sub for Mahdy Sean McDonald got some action on UCD's right and he cut inside to beat two defenders and score past Donnelly. 5-1 72mins. UCD kept the ball the next time they got it and through simple passing movement, inspired McDonald went again, this time right down the throats of the St Pats defenders and scored at the second attempt past Donnelly. 5-3 75 mins. With UCD Fans roaring them on UCD Players saw blood, it took a little longer for the next goal. A floating ball was missed by the Pats defenders, Simon Power in the box had to contort his body to hook a right-footer that didn't seem to have the pace to beat Donnelly, but he may have misjusdegd his jump and the ball found a way between the bar and Donnelly into the back of the net. 5-4 86 mins. 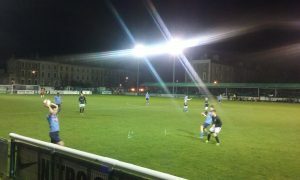 With St Pats rattled and UCD Players hoping to keep the ball for one more goal. But it proved a goal too far as with full-time approaching St. Pats went up the field, kept the ball at the corner flag and after a winning a throw the ball went out to the far post and St Pats sub Jason Grouse scoring unmarked. UCD had one ace to play, Conor Kearns went up for a UCD corner but with the ball getting cleared out of the St Pats box in stages, Kearns was reluctant to return to his own half and Grouse found himself with the ball way out out right just inside the UCD half and from there he found the corner of the net with a curling daisy-cutter. 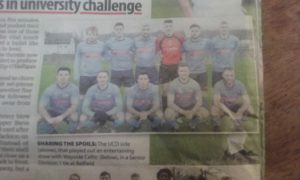 It was a second kick in the teeth for the team in 11 days as the Player may have felt they left something behind, but this squad of Players have brought immense pride to UCD AFC and UCD Fans. The UCD AFC Supporters Club want to thanks all our Underage Players at U19s, U17s and U15s for the huge efforts they've put in, they brought great prestige to UCD and the club.